I often feel that people misinterpret Kata’s such as Tekki/Niahanchi and perform them in a fast and flicky fashion with hand techniques that start from the elbow rather than from the floor and with leg techniques from the knee not from the supporting foot and through the hips. It seems to me that there is a disconnect from upper and lower body instead of a unification. My feeling is the Kata should be very robust in nature and the techniques are for short range power generation and close quarter delivery. The Kata has the potential to be able to use grappling and manipulation, so if you think you could control and move someone’s body weight with just the use of arms you must have forearms like Popeye’s. There is a common principle in MA that if you wish to move someone’s body you must move your own body. I fail to see that principle being applied with some of the static performances of Tekki/Niahanchi. You would be in for a shock if you think that the technique you have just applied to a compliant opponent in the Dojo would work in a real situation. Remembering when you practice Kata as a solo exercise you have no real feedback, you must use intention along with genuine belief and understanding of your ability to apply your technique. Practise a technique that wouldn’t work is practicing to fail. Very often you see Instructors making minor adjustments to a student’s stance or arm position, this is after they have finished moving. More importantly is how they transitioned to that position. Kata is about movement, not a series of still photographs. No point telling a student that something is very important and not showing or explaining the how or the why. Your Kata should always have intention. Just making shapes is for shadow puppeteers. If Beauty is only skin deep, some people must be living their lives inside out! The unequal equalizer was a phrase I first hear over 40 years ago. It was used by my old Sensei, Richard Jackson to illustrate how within a well structured Karate class, everybody has the same opportunity to perform at their highest level. It is still true today, especially in regard to people with disabilities. Having recently attended two championships for people with disabilities, The British Open at StokeMandeville and The European Championships in San Sebastian, Spain. More than ever I think I begin to understand that phrase. The style of the championships isn’t that of the usual Karate / martial arts competition, far from it in fact. It differs in so many ways and for me it is like a breath of fresh air. The athletes are not pitted against one and other in an arena to see who is the strongest, fastest and most skilled. Their challenge is to demonstrate their ability. There are so many categories for people with disabilities that you could not hold a standard tournament, nor do I think you would want to. It would be unfair to all involved, participants, officials and spectators. Let me try to give you a flavour of the events. You may see Kata being performed by wheelchair users. This ranges from novice to higher grades, or you may see self defence demonstrated form a wheelchair. At the Spanish event there was a young lady who gave a brilliant self defence display in her motorised wheelchair, mainly using her fully functioning good leg. She had no actual arms, only hands;I think she may have been a victim of the thalidomide drug. You also have people with learning disabilities, down syndrome, visibility and hearing impairments or autism also performing Kata or sometimes just Kihon (basics). This may be done individually or in a group and it may or may not have been with a coach along side. There would also be other self defence displays and people performing weapons Kata but most of all, the other things you are likely to see is how everybody supports each other. Their courage, their endeavours and their great camaraderie really register with you. What you don’t see is bad behaviour, big egos and prima donnas. You just get people trying to explore their potential with great commitment. There aren’t any losers, there can only be winners. It needs mentioning that there is no charge for competitors or spectators, the costs were covered through funding and sponsorship. Also a lot of the training schemes are funded and free for participants within Britain. At the European Championships, there was a slight hiccup. This came in the form of the WKF (World Karate Federation) trying to interfere with the event through reasons of their own. They gave ultimatums to the event organisers and some of the Karate-Ka that were affiliated to them. However, they were totally ignored and the event went ahead anyway. From my perspective they had no moral or ethical right to have tried to interfere with the event. I feel that these sort of events should be celebrated, encouraged and given whole hearted support. It was not specifically a Karate event; it was a martial art event. It leaves a bad taste in your mouth and puts shame on such an organisation. A long, long time ago when there was orks and goblins still roaming the world, Richard Jackson Sensei asked the senior members of his club if they would like to help him put on a demo at the local school fete. Great we thought a chance to do some recruiting but better still, to be able to show off! So over the next few weeks we put together a bit of a spectacle. You older readers will understand the sort of thing that I am talking about. There was tamishiwari that is breaking techniques. There was also knife and sword defence. Kata’s performed in Hakama’s. My main contribution to the event was throwing techniques but mainly being thrown. My friend and partner was an old style semi-professional wrestler. All in all I think we put on a fairly good show. There was lots of ooohs and aaahs from the crowd with enthusiastic applause and cheering. All the kids were running around asking for our autographs and plenty of enquiries about joining up. So as things began to settle down, we thought it was time to get changed and depart. As a group we were making our way back to the gym changing rooms. Mick Jackson, Ricks brother was following on behind. He hadn’t taken part in the Demo as he was on crutches. He had broken his leg about 6 weeks previously. 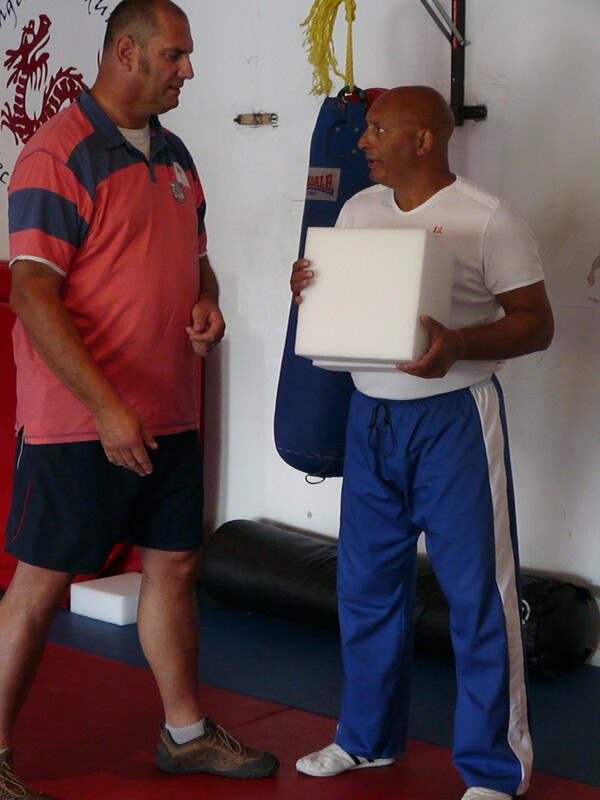 It had been quite a severe injury that had occurred during a National Squad training session at the Long Ford Dojo in Coventry. 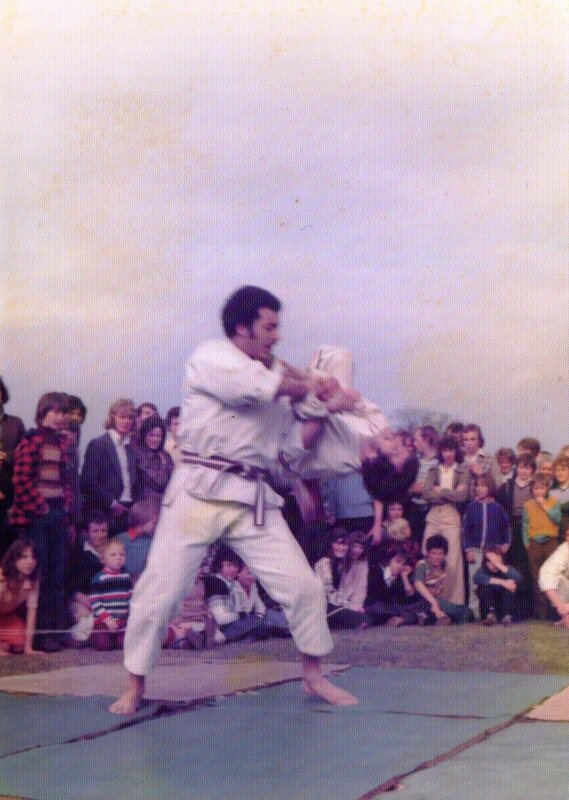 It happened during a clash with Sensei Bob Rhodes. As we were just about to go into the changing rooms, one of the lads called me back saying he thinks Mick has got some trouble and sure enough I can see that Mick is surrounded by 5 drunks. They were taunting him and trying to make fun of him. They must have thought he was an easy and vulnerable target, however they were wrong. Even though he has been on crutches Mick adapted his training and carried on throughout his injury. You have never seen anybody hop and punch oi-tsuki the way Mick could. My friend Frank and I are running back towards Mick and the drunks. As we approach one of the lads explodes backwards and lands flat on his back and doesn’t move (he’s out cold). The other drunks are momentarily shocked; they’re not sure what to do. I think that they were so surprised that somebody on crutches was able to knock one of their friends out; it was too much for their confused little minds to handle. It was at this point that Frank and I arrived on the scene. Oh I forgot to tell you about Frank. He is a young lad of about 18 and a brick layers apprentice. He is 6 ft 2in and all testosterone. He was extremely strong and supple. His party trick was to stand next to a doorway, lift his foot up and place it on top of the door frame as if kicking yoko geri. 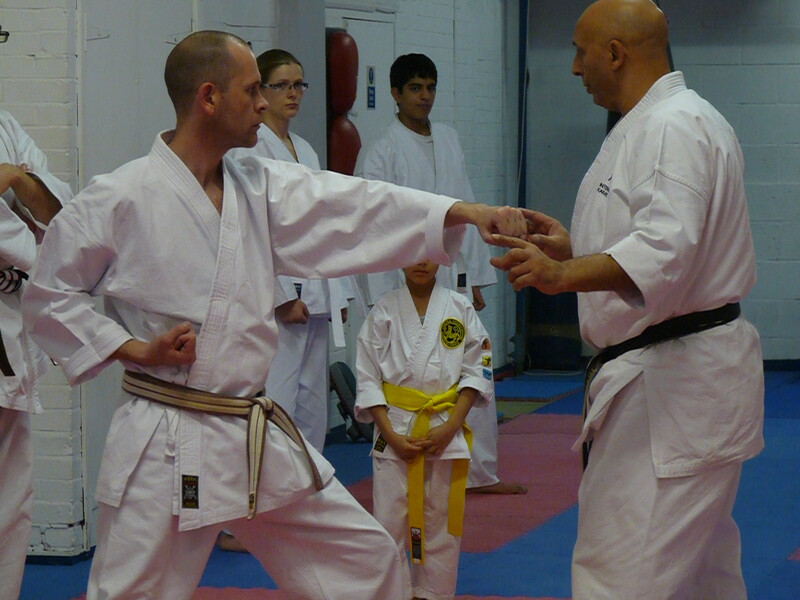 Frank later immigrated to Australia where he went on to be south Australia’s Kata and Kumite champion. One of the drunks turns as frank is running up. Without missing a step Frank chins him and down he goes. Mick’s on one crutch hopping and hoping one of the others will come near enough so that he can test his one legged oi-tsuki again. I grab one of the lads and swing him round into his mate, they both stumble over backwards. As I turn I am just in time to see a wild punch coming my way. I manage to duck under it and I am now in a position to be able to grab the dickhead in a strangle hold from the rear. I have got the strangle hold locked on and he is pretty subdued. It’s at this point that Frank looms up in front of us after having chased the other 2 lads off. Frank has yet to learn about restraint. He front kicks the lad I am holding in the lower abdomen. Frank’s kicks are really powerful. It knocks us both backwards and sits us both on our backsides. Personally I think it was overkill but you can’t have much sympathy for a bully. These lads were quite prepared to pick on somebody in a vulnerable position, outnumbering him 5 to 1. The aftermath of the whole affair was, 1 lad was taken to hospital via an ambulance, and 2 of them were arrested when the Police arrived. They spent the afternoon and the night in the cells. The Police told us to make ourselves scarce which we did. We were never asked to do a demonstration again in that area. Like with all demonstrations you always have sceptics; however the later demonstration proved how well Karate works in reality. A few years back I had been on a holiday with my grandmother and a girlfriend. It was the last day of our holiday and we made ready for our departure. We had just taken the hire car back to the Airport. We dropped it off at an office at the far end of the Airport. This left us with quite a bit of a walk to the departure lounge. Feeling a bit macho and taking responsibility I grabbed hold of 2 large suitcases (no wheels or trolley) and set off with the ladies following. Because of the direction of the route, we entered the concourse at the far end of the Airport. We were well away from the part that we needed to be at. I think that we must have entered at the arrivals. I notice that a large crowd mainly made up of armed and uniformed military looking types. There was a large empty space between where we had entered and this crowd of people. I began walking across the empty floor space. I hadn’t gone very far when I noticed that there was something wrong at the arrivals gate. The guys in uniform seemed to be getting very agitated and there is a lot of shouting in foreign languages. I am now on full alert and I turn to my grandmother and girlfriend and tell them to stay where they are. It’s at this point that I notice that there is a big guy and he is struggling with the military. He manages to break free from them and he starts to run towards me. Things aren’t looking good. A couple of the soldiers have drawn guns and they are pointing in my direction as the big fellow is still running towards me. I decide to take action. I drop the cases and step forward. I have got the guy lined up for a right cross. My thinking is that if I knock this geezer out, they won’t have to shoot him as I am in the firing line as well. I’m also thinking that I will be the hero of the day. He is only a few metres away when a guy on a louder hailer steps forward from the crown and shouts “OK David that’s great” the big guy stops running and we are both standing looking at each other. He has got a very concerned look on his face. I must have appeared to be looking very aggressive as well as very confused. Neither of us said anything as he turns to walk away. It is at this point that I realise who the big guy is. It was none other than David Soul of Starsky & Hutch fame. It dawns on me that I have just walked into a film set and almost decked the star. I think we both had a narrow escape that day. Just a few more seconds and I could have gone from hero to zero and David Soul would have gone from star to struck!! No I didn’t recognise him at first either!! There are times when working on the door when you can spot who is going to get thrown out later. You see punters as they come through the door and you just know that they will end up being ejected. My friend and colleague Joe and I used to have bets on the outcome of the people that we spotted. It would only count if one of the other guys ejected them. I was always pretty good at getting it right. It’s a sense that would seem to manifest itself at tournaments. I would enter the main arena and be able to sense who I would end up fighting later that day. I remember going to a competition in Ipswich, we arrived after an early start and a long drive. The last thing you feel like doing is having to start fighting but hey that’s what your there for. You get changed and you find yourself a space to start warming up. You greet old friends, catch up and you start looking around at the opposition making assessments. That’s when I spotted him. I turned to a team mate and said “I bet that’s the one that I get”, “rather you than me” he replies. Oh yeah why’s that? I hear you say. Well I will tell you why! The guy I have just spotted happens to be a 6ft 7inch brute of ebony muscle. He is a Frank Bruno look alike. He is warming up and his technique is very fast and strong He has an amazingly long reach with both arms and legs. Anyway as the day progresses I manage to win through my pool and I’m due to meet the winners of the other pools. We are called to go to the area for the Semi’s. As we line up he’s on the opposite side and I’m drawn against him. Some days you just wished that you weren’t right all the time. He’s looking very formidable but what the hack I was having a good day myself. I’d had some good wins. You know some days you find that you are just in the zone. We are called up to take our bows and face off. Hajime (start) was called and we began circling each other. We’re both being very cautious as nobody likes to get this far in a competition just to lose because of a stupid mistake. It’s about a minute into the bout and no score. He’s either just about to start an attack or just feigning. Without even thinking about it, a response is triggered. I drive forward with a really sharp Kizami (front hand jab). 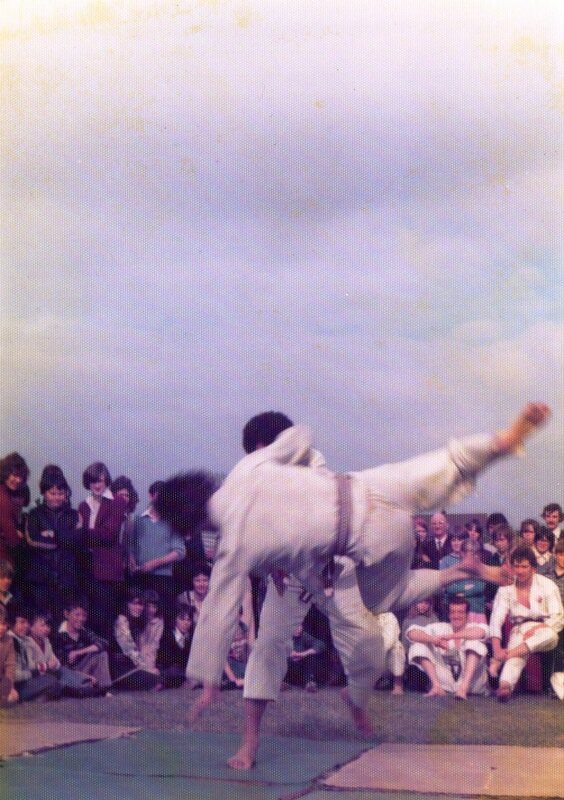 I must tell you that in those days of long ago competitions were Shobu Ippon, without mitts or even gum shields. I have hit him hard, right on the point of his jaw. It’s stopped him short and you could see that I had hurt him. Yame has been called and we go back to our marks. He’s looking at me with venom in his eyes and I’m thinking ‘sugar this looks bad’. The judges and the referees are conferring so either I am going to be disqualified or warned and I’m going to have to face his wrath. The referee comes back to his position and he looks very sternly at both of us, then his arm shoots straight up and I am awarded Ippon full point and I am the winner. I can’t tell you how relieved I felt at that moment. I went on to lose in the final but my day was made up with that one result. I attended a course and as soon as he walked through the door, I knew who my partner would be!! !